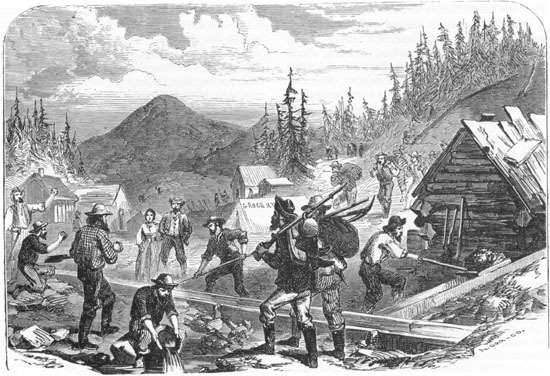 This is an engraving of gold miners in Colorado in 1859. Gold from the Pike's Peak region of Colorado began to be deposited at the Dahlonega Mint in 1859. In 1860 and 1861, over 44% of the total deposits for those years at the Dahlonega Mint came from Colorado. Source: Bowers, Q. David. United States Gold Coins, An Illustrated History. Los Angeles, CA: Bowers and Ruddy Galleries, 1982, page 20. Earlier from the New York Public Library Picture Collection.